Marina Bay Sands is one of the identifiable figures across Singapore’s skyline, with its three towers said to have been inspired by a deck of cards. 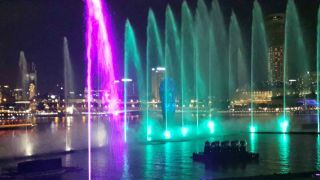 Among its evening attractions is Spectra, a free-to-public outdoor light and water show displayed over the water at the event plaza along the promenade. The vivid display over the lagoon is powered by a host of lighting and projection technology, housed safely in Tempest enclosures. The choreographed show – created by Australian-based experience agency Imagination with lighting and visual production designer Steve Nield – blends a host of technology including lights, lasers, audio, projection, and water screens. The powerful audiovisual elements come together to deliver a vibrant 15-minute spectacle that has enthralled thousands of guests in its first year of operation. A total of 70 Clay Paky Supersharpy lights are protected by 70 Tornado Marine enclosures, mounted on floating barges in the salt-water lagoon in front of the hotel, less than a meter above water level. Nine Christie Boxer 4K20 projectors – housed in Cyclone 300 enclosures – augment the experience with vivid projections on the lotus-shaped science and technology center next to the lagoon. Tempest equipment was supplied by Tempest’s distributor Hexogon Solutions. The show is set to run at Marina Bay Sands for four more years.